First question -- have you had your car’s air conditioning checked recently? 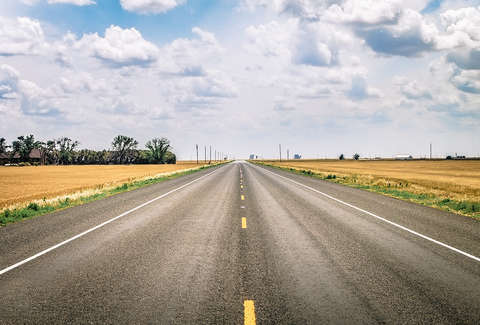 If the answer is yes, then there’s no excuse not to put pedal to metal this summer and traverse the great state of Texas on an epic road trip. 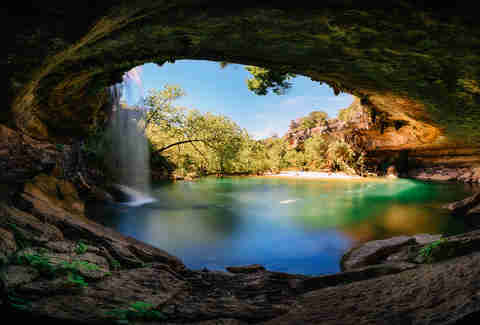 There are dozens of tiny Texas towns worth visiting, but we’ve charted one route from Austin to the town of Utopia that includes just about everything you need for a successful trek: waterfalls, spelunking, flowers, fresh fruit, vintage cowboy hats, rocks shaped like primates, horseback riding, and of course, swimming. So, double-check that A/C and hit the ground running. The sooner you get out the door, the sooner you’ll be swimming beneath the oak trees. A reservation-only waterfall might sound like a pending sign of the apocalypse, but it’s actually a welcome change from the days of waiting in a one-in, one-out line of cars for hours. Book a time online, then bask in the glory of this wondrous limestone dome and patchy strip of beach. Bacteria levels sometimes make the water inaccessible (don’t fret, there’s more swimming to come), but at least count on a quick trail hike and a video of 50 feet of crashing water. 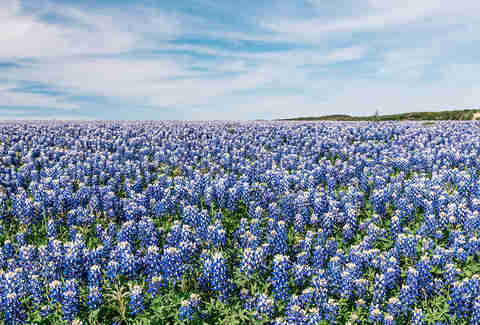 Little-known fact: There are five varieties of bluebonnet and they’re all Texas state flowers. Power fact number two: Contrary to popular belief, it’s not actually illegal to pick them. So go forth, ye young ‘Grammer, find yourself a patch of bluebonnets somewhere along the highway, lay down and spread your wings into a bluebonnet angel, or just smile for the camera. You look great in blue. 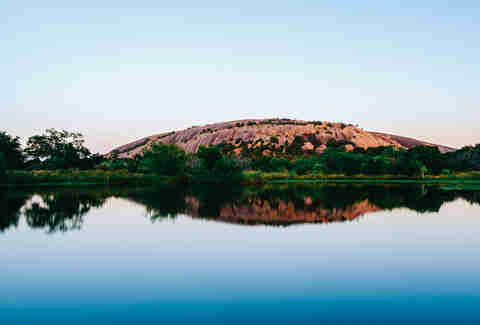 A quick hike to the summit of Enchanted Rock can be scorching in the summer heat, so once you’ve soaked in the view, chill out by spelunking down into a network of easy to navigate, epically cool caves. They’re simple to find: Just wander around the top of the plateau for a few minutes and you can’t miss the crevices that lead to the most prehistoric hang outside of Jurassic World. 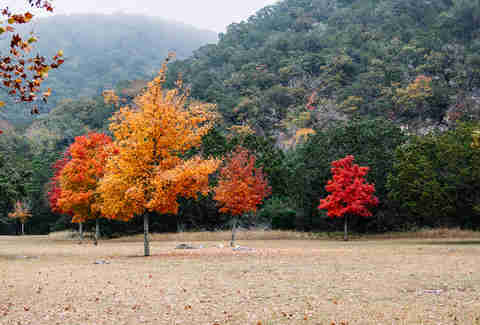 If you already have typical gas station supplies like jerky and soda, add a little healthiness to your snack collection by hitting a roadside peach stand or one of the many orchards dotting the Central Texas landscape. Don’t want that sticky juice making a mess of your interior? 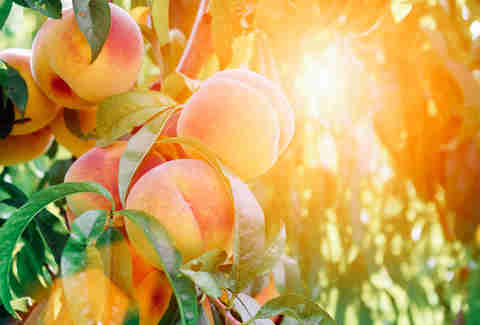 Most places have a list of peach products longer than a Bubba Gump monologue, including jams, jellies, cobblers, sauces, salsas, and -- most vital to battling the summer heat -- ice cream. Bandera has been cattle-herding country since before the west was won. History buffs can soak in the heritage at the Frontier Times Museum with artifacts dating to the late 1800s, but the best way to celebrate cowboy culture is to live it. Dude ranches all over the area offer opportunities to charter a ride, which will pair perfectly with that Stetson you scored in Fredericksburg. 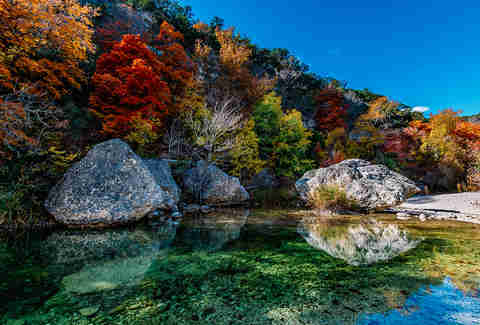 Running Southeast from Lost Maples, the Sabinal River is one of the nearly 4,000 rivers and streams giving Texans a refreshing solution to the bajillion-degree heat. Pull over at Utopia Park and make your way through the cypress and oak trees to the glorious chilly waters of the river, which are great for not just swimming, but also fishing and canoeing. The best part of movies are montages, and every montage needs weird antiques and a couple big hats. Nestled between Fredericksburg’s biergartens and wineries are the town’s excellent antique shops. They’re full of cocktail glasses, vintage furnishings, and every type of brick-a-brack you can imagine. 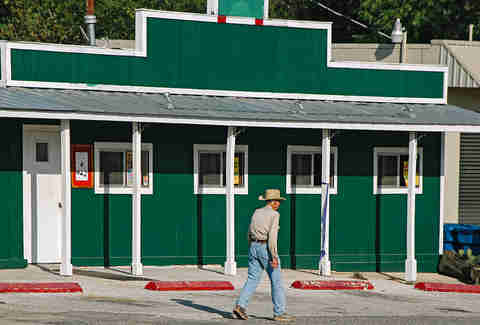 Odds are you won’t buy anything, but if you do find something worth taking home, it’ll probably be patently Texan -- i.e., keep a lookout for great vintage Stetson cowboy hats.